The only ASUS card in the roundup, the Asus Extreme N6600TOP/TD/128M/A stands out for interesting choices the manufacturer has made with its core and memory speeds. While it uses the slower Geforce 6600 core as opposed to the 6600GT employed by most of the cards we looked at, ASUS has included 128MB of fast 2.0ns Samsung GDDR3 memory and clocked the card to a higher than standard 400MHz core/900MHz memory setting. This puts it in a place between a stock 6600 and 6600GT. Driver CD, CD Manual, Joint Operations: Typhoon Rising CD, AsusDVD CD, PowerDirector 3DE CD, Medi@ Show SE 2.0, DVI to analog converter, S-Video to Composite Cable. The fairly hefty aluminium heatsink was almost completely silent during our testing. 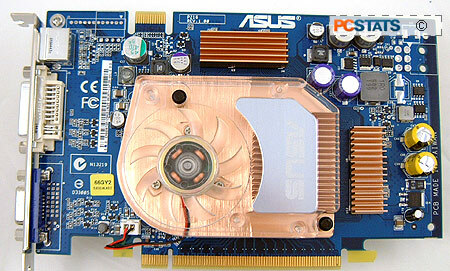 ASUS has also included memory heatsinks, which is a nice touch and might (or might not) help overclocking. 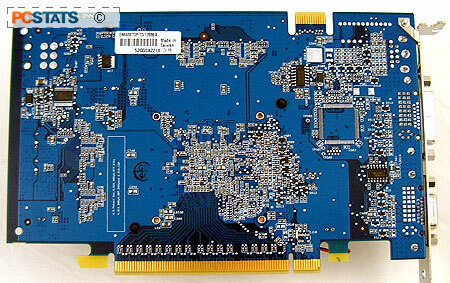 The front of the card features the standard VGA, DVI and S-video/breakout cable connectors. The software bundle is slightly on the small side, with Joint Operations: Typhoon Rising being the only game included. Copies of AsusDVD, PowerDirector 3DE and Medi@ Show SE 2.0 round out the software, while ASUS throws in a DVI-analog converter for dual CRT action as well as an S-video to composite cable for TV-out. Overclocking: With its speedy Samsung memory and RAMsinks, we were looking forward to seeing what kind of overclocking results we could ring out of the ASUS Extreme N6600TOP/TD/128M/A. Suffice to say that the card did not disappoint us. The maximum core overclock was a massive 623MHz, 223MHz over its stock speed... That's over a 50% overclock! None of the Geforce 6600GT cards in this roundup managed to get that high. The memory did well too, topping out at 1030MHz. With results like these, we have to speculate that ASUS is using a 6600GT core in the ASUS Extreme N6600TOP/TD/128M/A card.